Wheelchair rugby is a team sport for athletes with a disability. Developed in Canada in 1977, it is currently practiced in over twenty countries around the world and is a Paralympic sport. The sport's original name was murderball; in the United States , it is referred to as quad rugby. All wheelchair rugby players have disabilities that include at least some loss of function in at least three limbs; most are medically classified as quadriplegic, although some are functionally closer to paraplegics. Wheelchair rugby is played indoors on a hardwood court. The sport of wheelchair rugby is governed by the International Wheelchair Rugby Federation which was established in 1993. Wheelchair rugby's roots go back to wheelchair basketball and ice hockey. It was created in 1976 by Jerry Terwin, Duncan Campbell, Randy Dueck, Paul LeJeune and Chris Sargent, five Canadian wheelchair athletes in Winnipeg , Manitoba to be a sport for quadriplegics. At that time, wheelchair basketball was the most common team sport for wheelchair users. That sport's physical requirement for players to dribble and shoot baskets relegated quadriplegic athletes, with functional impairments to both their upper and lower limbs, to supporting roles. The new sport — originally called murderball due to its aggressive, full-contact nature — was designed to allow quadriplegic athletes with a wide range of functional ability levels to play integral offensive and defensive roles. Murderball was introduced to the United States in 1981 by Brad Mikkelsen. With the aid of the University of North Dakota's Disabled Student Services, he formed the first American team, the Wallbangers. The first North American competition was held in 1982. In the late 1980s, the name of the sport outside the United States was officially changed from Murderball to Wheelchair Rugby. In the United States, the sport's name was changed to Quad Rugby. The first international tournament was held in 1989 in Toronto , Canada , with teams from Canada, the United States and Great Britain. In 1990, Wheelchair Rugby first appeared at the World Wheelchair Games as an exhibition event, and in 1993 the sport was recognised as an official international sport for athletes with a disability by the International Stoke Mandeville Wheelchair Sports Federation (ISMWSF). In the same year, the International Wheelchair Rugby Federation (IWRF) was established as a sports section of ISMWSF to govern the sport. The first IWRF World Wheelchair Rugby Championships were held in Nottwil , Switzerland, in 1995. Wheelchair rugby appeared as a demonstration sport at the 1996 Summer Paralympics in Atlanta , and was granted full medal status at the 2000 Summer Paralympics in Sydney , Australia. There are currently twenty-four active countries in international competition, with several others developing the sport. The current President of the IWRF is Brad Mikkelsen. Wheelchair rugby is mostly played by two teams of up to twelve players. Only four players from each team may be on the court at any time. It is a mixed gender sport, and both male and female athletes play on the same teams. Wheelchair rugby is played indoors on a hardwood court of the same measurements as a regulation basketball court — 28 metres long by 15 metres wide. The required court markings are a centre line and circle, and a key area measuring 8 metres wide by 1.75 metres deep at each end of the court. The goal line is the section of the end line within the key. Each end of the goal line is marked with a cone-shaped pylon. Players score by carrying the ball across the goal line. For a goal to count, two wheels of the player's wheelchair must cross the line while the player has possession of the ball. A team is not allowed to have more than three players in their own key while they are defending their goal line. Offensive players are not permitted to remain in the opposing team's key for more than ten seconds. A player with possession of the ball must bounce or pass the ball within ten seconds. Teams have twelve seconds to advance the ball from their back court into the front court and a total of forty seconds to score a point or concede possession. Physical contact between wheelchairs is permitted, and forms a major part of the game. However, physical contact between wheelchairs that is deemed dangerous — such as striking another player from behind — is not allowed. Direct physical contact between players is not permitted. Fouls are penalized by either a one-minute penalty, for defensive fouls and technical fouls, or a loss of possession, for offensive fouls. In some cases, a penalty goal may be awarded in lieu of a penalty. Common fouls include spinning (striking an opponent's wheelchair behind the main axle, causing it to spin horizontally or vertically), illegal use of hands or reaching in (striking an opponent with the arms or hands), and holding (holding or obstructing an opponent by grasping with the hands or arms, or falling onto them). Wheelchair rugby games consist of four eight-minute quarters. If the game is tied at the end of regulation play, three-minute overtime periods are played. Much like able-bodied rugby matches, highly competitive wheelchair rugby games are fluid and fast-moving, with possession switching back and forth between the teams while play continues. The game clock is stopped when a goal is scored, or in the event of a violation — such as the ball being played out of bounds — or a foul. Players may only be substituted during a stoppage in play. Wheelchair Rugby is played in a manual wheelchair. The rules include detailed specifications for the wheelchair. 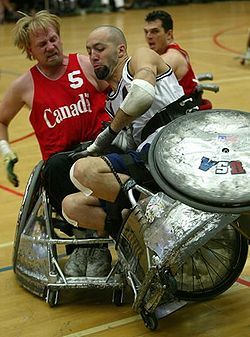 Many players use custom-made sports wheelchairs that are specifically designed for wheelchair rugby. Key design features include a front bumper, designed to help strike and hold opposing wheelchairs, and wings, which are positioned in front of the main wheels to make the wheelchair more difficult to stop and hold. All wheelchairs must be equipped with spoke protectors, to prevent damage to the wheels, and an anti-tip device at the back. New players and players in developing countries sometimes play in wheelchairs that have been adapted for wheelchair rugby by the addition of temporary bumpers and wings. The wheelchair rugby ball is identical in size and shape to a regulation volleyball. Wheelchair rugby balls are typically of a 'soft-touch' design, with a slightly textured surface to provide a better grip. The balls are normally over-inflated compared to a volleyball, to provide a better bounce. The official ball of the sport from 2000-2006 is the Molten soft touch volleyball, model number WR58X. Players use a variety of other personal equipment, such as gloves and applied adhesives to assist with ball handling, and various forms of strapping to help them maintain a good seating position. To be eligible to play wheelchair rugby, athletes must have some form of disability with a loss of function in both the upper and lower limbs. The majority of wheelchair rugby athletes have spinal cord injuries at the level of their cervical vertebrae. Other eligible players have multiple amputations, polio, or neurological disorders such as cerebral palsy, some forms of muscular dystrophy, or Guillain-Barré syndrome, among other medical conditions. Players are classified according to their functional level and assigned a point value ranging from 0.5 (the lowest functional level) to 3.5 (the highest). The total classification value of all players on the court for a team at one time cannot exceed eight points. The classification process begins with an assessment of the athlete's level of disability to determine if the minimum eligibility requirements for wheelchair rugby are met. These require that an athlete have a neurological disability that involves at least three limbs, or a non-neurological disability that involves all four limbs. The athlete then completes a series of muscle tests designed to evaluate the strength and range of motion of the upper limbs and trunks. A classification can then be assigned to the athlete. Classification frequently includes subsequent observation of the athlete in competition to confirm that physical function in game situations reflects what was observed during muscle testing. Athletes are permitted to protest their classification if they feel they have not been properly evaluated. Athletes can be granted a permanent classification if they demonstrate a stable level of function over a series of classification tests. 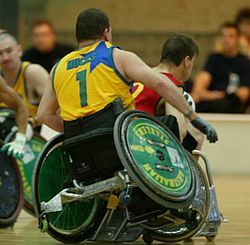 Wheelchair rugby classification is conducted by personnel with medical training, usually physicians, physiotherapists, or occupational therapists. Classifiers must also be trained in muscle testing and in the details of wheelchair rugby classification. The major international competitions in wheelchair rugby are Zone Championships, held in each odd-numbered year; World Championships, held quadrennially in even-numbered years, opposite the Summer Paralympic Games; and the Paralympic Games. The 2006 World Wheelchair Rugby Championships was held in Christchurch , New Zealand from September 12-16, 2006, of which the final was streamed live on the Television New Zealand website. Wheelchair rugby was also on the program for the 2004 Summer Paralympics in Athens , Greece and the 2008 Summer Paralympics in Beijing, China . Wheelchair rugby was featured in the Oscar-nominated 2005 documentary Murderball. The character Jason Street in the NBC television show Friday Night Lights, having been paralyzed in a game of American football in the pilot, tries out for the United States quad rugby team in a later episode. Prior to 2002, the United States was undefeated internationally, having won gold at the 1995 and 1998 World Championships, and at the 1996 and 2000 Summer Paralympics. Canadian star Garett Hickling was named the Most Valuable Player at the first three World Championships in the sport's history. No MVP was selected at the most recent World Championships, which were held in Christchurch , New Zealand in 2006. Beijing 2008 Paralympic Wheelchair Rugby Information with an Australian slant from accessibility.com.au - includes nomination criteria for the 2008 Australian Paralympic Wheelchair Rugby squad.